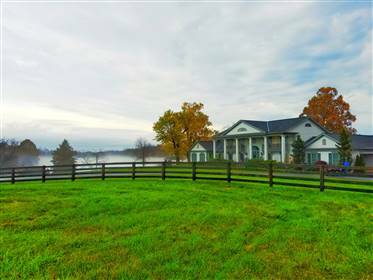 Queenslake is a the most picturesque working horse boarding and training facility in the Kentucky blue grass region. The 140 acre property features a 40 acre lake, three unique horse barns, 3 horse arenas (one indoor) and 29 rolling pastures. There are approximately 40 horses on the property, and the main residence hosts its own Bed & Breakfast. Queenslake is in the heart of Kentucky in Horse Country and on the Bourbon Trail. 10 minutes from Kentucky Horse Park. 15 Minutes from Keeneland Race Track.